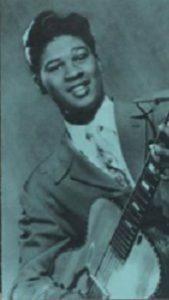 The first pure rock guitarist of note, more specifically somebody who hadn’t drifted into the field from another genre, was Jimmy “Baby Face” Lewis, all of 16 years old when he first gave notice as to his promise with two vital pre-rock cuts in the spring of 1947, hampered by the group behind him, but leaving no doubt that he was an ahead of his time visionary. That there’s so little information that exists on Lewis only adds to his aura. His birth date is sketchy and he may have been from Canada, but how he came to be a professional musician while only in his mid-teens is part of the mystery. What is known is that upon his appearance at clubs around Baltimore in the mid-1940’s he was dubbed “The Madman Of The Guitar” for his flamboyant playing style that didn’t adhere to any rules of decorum on an instrument that had typically remained in modest supporting roles in all forms of music to that point. Attracting quite a bit of attention for this he was signed to cut one-off sessions for a variety of labels over the next year resulting in a handful of sides for Aladdin, Savoy and Manor before finally finding some permanence in 1949 upon signing with Atlantic where he remained until 1951. While there he joined fellow Atlantic act Joe Morris’s band on the side for a short time as well. He then departed for RCA before returning to Atlantic in the mid-1950s, first on their Cat subsidiary and then back on the parent label cutting with Floyd Dixon’s crew after which his trail grows cold. When we next hear of him it’s not for any guitar pyrotechnics but rather for a drug bust in 1963 after an undercover sting operation snagged him along with two hundred thousand bucks worth of dope and landed Lewis in the headlines at last. He deserved headlines for his musical innovation long before that and of the many obscure talents in rock history, Lewis, whose often incendiary work on the guitar well before the instrument itself had been widely featured in rock ‘n’ roll, remains one of the more interesting and enduring mysteries still to be untangled.